Bulgarian midfielder Radostin Kishishev has returned to Leeds from Leicester on a one-month loan deal. The 33-year-old, who moved to Leicester from Charlton in the summer, played 10 games for United last season while on loan from the Addicks. 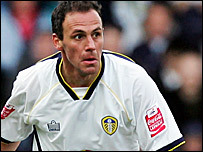 Leeds boss Dennis Wise moved to sign Kishishev as Alan Thompson and Andrew Hughes are struggling with injuries. Kishishev has been given permission to play in the Johnstone's Paint Trophy area quarter-final against Bury.